Factoid # 66. In the mid-19th century Europeans visited spas. Partaking of the mineral water, and soaking in the warm water was a luxury favoured by the wealthy. Such a personal luxury was available almost next door to Richmond. J. L. Gourlay in the History of the Ottawa Valley told of the humorous meeting of three Richmond characters: Edward Malloch the wealthy land speculator and member of the provincial Legislature, Rev. Terrance Smith the Catholic priest at St. Philip’s from 1836-1847, and Rev. Robert Short the rector of St. John’s Anglican Church from 1828-1834. Factoid # 67. Towards the end of the 1840s the old Richmond elite began to pass away. In 1847 Capt. Joseph Maxwell, the Irish born officer known for his love of agriculture and breeding of sheep, was the first to go. Two years later Capt. John B. Lewis, the English officer known for his business enterprises and political endeavours, followed him. In the obituary for Capt. John Lewis we see mention of the waters famous in the Canadas. Factoid # 68. The Caledonia Springs, located southeast of Ottawa, were discovered in the 1820s and by 1835 had developed into a destination for affluent people from Montreal and Ottawa. Even Europeans looking for a cure came for the summer. Several hotels sprang up around the springs. In the early years visitors accessed the area by boat via the Ottawa River and then by road from Grenville (near Hawkesbury) or l’Orignale. Day-trippers or overnighters from places like Richmond could use the road system. one saline fed the bathhouse. Each type was thought to have different healing powers. The presence of carbon dioxide made the water foamy. A side industry developed – the bottling and selling of the water. By 1898, most visitors came by train as the spa was located on the Canadian Pacific Railway’s line between Ottawa and Montreal. The railway touted the “Grand Hotel” – a three-storey edifice with 100 rooms. 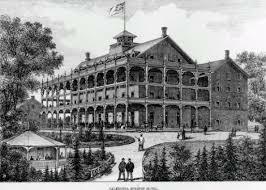 There were also other accommodations: a smaller hotel, several inns, and rooming houses. The Grand closed in 1915 and there are no functional buildings left in the ghost town. Factoid #69. In January 1850 Richmond became an incorporated village with all the same powers as Goulbourn and the other surrounding townships. The Village Council had the right to levy taxes and pass bylaws. The Richmond Reeve was also a member of the Carleton County Council and eligible to be County Warden, the highest position in the local government. Factoid #70. The “Richmond Sesquicentennial” quotes the minutes of the first village Council meetings. The first Council, chosen unanimously, reflected the emergence of new leaders: George Brown, William Lyon, Thomas Lewis, Patrick McElroy and James McLean. The Council chose William Lyon to be the first Reeve. Who were these men? George Brown was a village merchant and was the first occupant of the limestone building, which still graces the corner of Strachan and McBean streets. William Lyon was a son of Captain George Lyon and owned the stone store that still stands on McBean Street at the Jock River. Thomas Lewis was the third eldest son of Captain John Lewis and ran the family store (probably on Strachan St.). Patrick McElroy had arrived in the village with his father Sgt. Henry McElroy and was a merchant and notary. His store was across Strachan St. from George Brown’s store. James McLean owned an Inn and tavern at the corner of Fowler and Strachan Streets. The only municipal official who had been involved in the original military administration was Garrett FitzGerald who became the clerk of the new village government. This entry was posted in Events, government, Locations, Personalities. Bookmark the permalink.